Cambridge, Mass.-based Eastern Wind Power (EWP) is about to launch a wind turbine that could soon be spotted on roofs of urban high-rises, at remote industrial plants, or in developing countries, providing power for basic needs like drinking water and lighting. Unlike the propeller-type horizontal axis wind turbines that are common in many parts of the world, EWP’s vertical axis wind turbine has three vertical six-meter high carbon fibre blades. The benefits of this vertical configuration include lower noise, less risk to birds, no gearboxes and their associated mechanical issues, and they can be erected closer together than traditional wind turbines. From the outset,, EWP has focused on quality, reliability and durability in the design and development of its Sky Farm 50kW Vertical Axis Wind Turbine. Not satisfied with the bolt securing solutions they had used previously, EWP tried Nord-Lock wedge-locking washers and were amazed with the results. The idea of switching back to another solution is now unthinkable to them. With its wind turbine tested and proven, and Siemens Industry on board, Eastern Wind Power has recently started marketing activities. The project is in particular receiving a lot of interest from markets like Hawaii and the Caribbean where the energy prices are as high as the wind speeds. James Brooks, President of Nord-Lock Inc., calls EWP “a fantastic example of a progressive original equipment manufacturer (OEM)” in the wind power segment. “In the last four years Nord-Lock in North America has seen its OEM business grow as a result of companies like EWP focusing on innovation and safety – and safety of bolted joints is our primary mission,” he says. 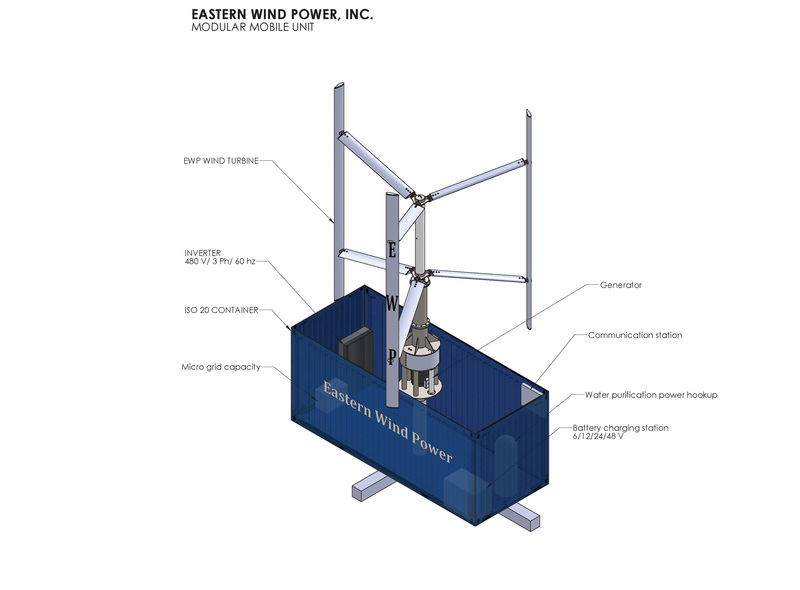 Eastern Wind Power, Inc. has designed a mobile wind energy technology for disaster relief services, rural electrification micro-grid application, rural communications ground stations, and for military defense field operations. It would establish or feed into a local grid network, assisting in filling the capacity needs of a centralized grid for various base needs, or function as a stand-alone system for field and rural power needs. We have created an efficient, quiet and reliable vertical axis wind turbine of commercial capacity, but of small enough scale to power a small community or key service within a community. Clean water and basic lighting are two direct ways of providing basic human comforts to areas unreachable by conventional power distribution systems. Our turbine can be used to power deep well pumps to power cisterns throughout the day and night, creating a “head” to run a small community water system or irrigate a farm. There can be battery charging stations for charging motorcycle type batteries for home use allowing: students to run lap tops; houses to run LED lights and communication equipment; rural farms to light structures and power equipment. We have adapted our Sky Farm™ 50 kW vertical axis wind turbine to fit in, and assemble out of a 20’ ISO shipping container, using it as the turbine’s “foundation”. • The unit is sized to be transported by ship and then by either a mid-sized tractor or helicopter. • The mobile unit can feed a field micro-grid with the power as is required, be it 48 volt battery storage for reserve power or live time 220/480 Volt – 3 phase @ 60 or 50 Hz. feeds. • The unit can serve as a self-contained power station, including on-board battery power storage systems, communications centers, grid distribution nodes, and mobile battery charging station. • The turbine blades will be hinged at their connection joints and will open like a tripod, with the blades locking in the open rigid position. The turbine tower would be transported in the same container – being (3) 19’ sections designed for field assembly. The unit is simple to install in the field as the hydraulics are adapted from a typical fire truck design to lift the turbine in place at the height appropriate for its utility and security. The trailer will have retractable outriggers for stability on any slope or terrain, locking the system in-place, thus freeing up the delivery vehicle for other transport duties. 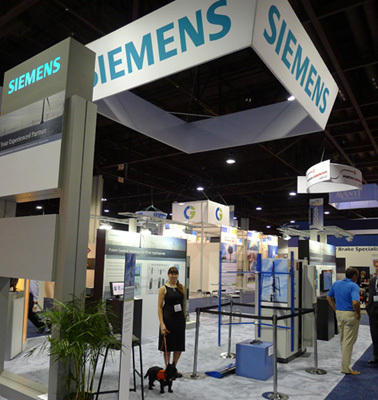 Linda Haar – Eastern Wind Power, and Razvan Panati – Siemens Industry, setting up exhibit. Andreas Hartinger – Siemens Industry and Jonathan Haar – Eastern Wind Power. Lucy, EWP’s mascot, joins the show. Weather.com video More and more, wind is becoming a booming market for alternate energy. 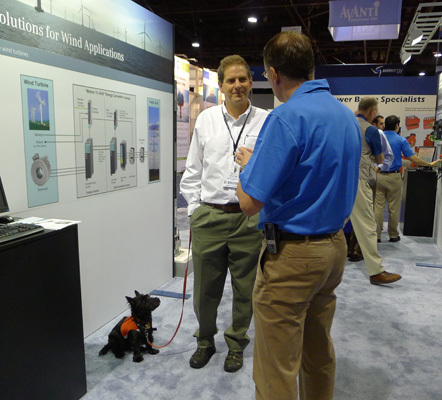 Meteorologist Carl Parker takes a look at how the power from wind can create electricity and jobs. Chicago is known as the Windy City, but in truth, Boston is breezier. Beantown has the highest average wind speed of any major city in the United States, at 12.4 mph. Does it make you wonder how much energy might be generated if wind turbines were placed atop some of its tall buildings? It makes the folks at Eastern Wind Power wonder. A maker of vertical-axis wind turbines, EWP has embarked on a project to gather wind data from 10 high-rises in Boston. It hopes to show that its turbines could be significant power producers for big-city buildings. EWP so far has Web-based weather stations from Onset Computer Corporation on two buildings – the Equity Office Properties building at 60 State Street and the Massachusetts Eye and Ear Infirmary – to measure wind speed, wind gust and wind direction. The plan is to collect data from eight more high-rises in downtown Boston by 2013. Exactly how much wind is available is a hugely important factor in wind power. That’s because the power in the wind is proportional to the cube of its speed. So the amount of power produced rises exponentially as the wind speed increases. According to the Department of Energy, if your site has an annual average wind speed of about 5.6 meters per second – or about 12.6 mph, very close to Boston’s average – it has twice the energy available as a site with a 10 mph average. This takes on added importance with small systems because, to be honest, they are lilliputian compared to wind’s big boys. The mammoth horizontal turbines spinning away in Texas and California and elsewhere can pump out 2 megawatts or more of power. EWP has a 50-kilowatt (kW) vertical-axis turbine. EWP says a collection of 10 of its 50-kW Sky Farm turbines could trim a 500,000-square-foot high-rise’s power needs by 10 percent. That estimate is based on on wind studies it did on the Massachusetts Institute of Technology’s Green Building in Cambridge (where EWP is based). There, the company said, a single Sky Farm would generate about 45,000 kilowatt-hours of electricity per year – enough to power six to eight homes. EWP has partnered with Siemens to develop on improving its generator and inverter system. It erected a prototype at the Martha’s Vineyard Airport in 2010 and that turbine is now grid-connected and producing power for the airport.